The most powerful realtime digital video editing and compositing software for Windows NT & 2000 - Now with improved batch capture! 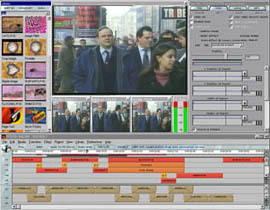 Speed Razor an invaluable tool for long and short form professional editing projects for film, television broadcast, animation, and multimedia. It provides important improvements in batch capture and print to tape, expands hardware support, and fixes a number of outstanding software issues. Speed Razor also provides a Garbage Matte and other effects. Speed Razor 5.5 is available as an upgrade from Speed Razor 4.x/2000/X. Speed Razor is built for high-speed, high-quality editing and compositing. The interface is streamlined and fully multi-threaded for fluid workflow. Editing tasks have extensive keyboard and mouse shortcuts, with new trim and preview options, letting you work quickly and accurately through all phases of a project. And it delivers dramatically fast processing speed for video effects. Speed Razor features multiple preview windows, a stand alone VU meter and new customizable tool bars, adjustable color schemes, and other user options. Developed for a broad range of professional post production and broadcast needs, in-sync Speed Razor features multiple input and output up to D1 quality, full field rendering, no project length limits, flexible effect compositing tools, and real-time audio mixing (up to 20 tracks).